Read this book, 'HUNTING FOR HIDDEN GOLD'! Do you like suspense, danger, and mysteries? This has all three of them! 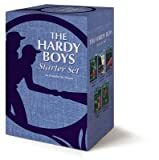 The Hardy boys meet very many dangerous times and suspense. But nothing hinders the boys! They bravely go through the mysterious fog and finally, they solve it! I love~~~~~~~~~~~~~~~~~~~~~this book!